AJ Waste Systems - Your Full Service Refuse & Recycling Co.
AJ Waste Systems - Your full service refuse and recycling company for over 50 years. Call AJ Waste Systems today: 203-272-1992. For your home clean outs, or construction jobs. Fast, friendly and dependably service. 12 Yard, 20 Yard or 30 Yard Containers . 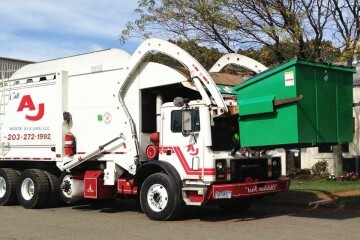 AJ Waste Systems offers weekly commercial trash and recycling service. If you’re a new business we can help implement a fast and affordable trash and recycling plan. Call us today 203-272-1992 ask about our home owners discount! Construction and demolition roll-off containers offered in 6, 8, 12, 20 & 30 square yards. We are on time, and prepared to assist and provide within 23 hours notice. Cleaning out or cleaning up we have solution for you. Bulky Waste drop off, open to the public. We have a proven record of accomplishment and are a reputable company in Connecticut. We ensure each customer is treated with utmost professionalism. Offering clients 24 hour support and accessibility. For us, honesty is the only policy and we strive to service all customers with integrity, not just with our clients, but also our brokers and contractors. 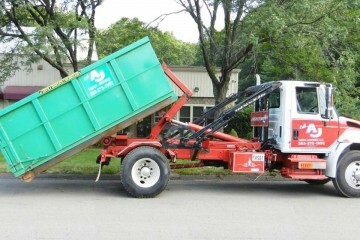 With thousands of happy customers, we are one of the most trusted trash hauling companies in Connecticut. We commit ourselves to keeping proper scheduled pick ups within the timeline set with our clients. We use the best of technology and tools to ensure that all jobs are done quickly but also giving attention to details and ensuring everything is done correctly. AJ Waste Systems, Inc. is located at 22 Burton Drive Cheshire, Connecticut. We are your local waste and recycling company in the Greater Cheshire area and are here to provide you with knowledgeable, professional, and reliable service. 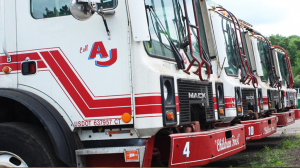 AJ Waste Systems operates as a family owned and operated business providing excellent service to each and customer. Established in 1960, AJ Waste Systems has extensive waste hauling expertise, and we pride ourselves in making your day easier through our remarkable services. "My elderly mother recently decided to sell the house she had lived in for 46 years and move down to Florida to join my aunt in a retirement community." Thank you so much for responding so quickly. We were able to get so much stuff into the container, it was a life saver. Thank Carl Taggett so much for the help!" My client told me how AJ was able to help him out in such short notice. Thank you so much for the quick response. Otherwise, closing would have been delayed. We did not need the largest container, but the owner of the company personally help us out get the right size for our job. I will definitely be using this service again! Great service, expert advice & low prices. They really care & took the time to figure out what worked best for our small business needs. I recommend them all the time over the big corporate waste companies. I had service with one of the new trash companies from Southington. When I needed to decrease the service the owner was very rude. I called AJ Waste, the salesman was friendly and helped me get out of my service agreement with that hauler. He was extremely knowledgeable of the industry and walk me through the whole cancelation process. I recommend AJ service to every company we do business with in the southington area. 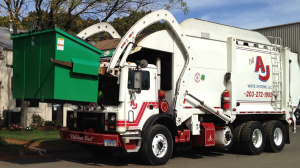 AJ Waste Systems, LLC has been operating in the Cheshire, Connecticut area as a family owned and operated business providing excellent service to each and every customer since 1960. If you come all the way down here, you probably really like AJ Waste Systems. To save you all the troubles finding where to order your container, we have a solution for that too. Just click the button below. Proudly Servicing : Cheshire, Greater Waterbury, Southington, North Haven, Hamden and surrounding towns. © 2016 AJ Waste Systems,LLC . All rights reserved.